Why are Citations and Listings Management Important? Where Do You Find Citations and Listings? 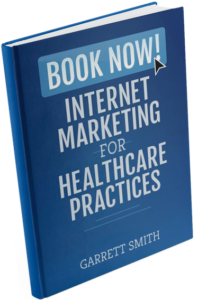 In the vast world of the internet, hundreds of business and medical directories have sprung up over the years with the goal of helping caregivers and patients find the right provider. You may have gotten a random email or phone call about one. Perhaps you have even found one yourself as you explored online. These directories, many of which you’re already familiar with, often create profiles for you and your practice locations without you even knowing it. In their pursuit of helping patients (and themselves), these directories often buy or scrap data from other sources in order to create your profiles. This often leads to profiles with inaccurate, missing and or outdated information that can have a big impact on your practice. One, many of these directories, such as Healthgrades and SuperPages, are popular with patients searching for a healthcare provider online. If you have an old, outdated or inaccurate profile you risk turning off a potential new patient. You don’t want a patient to call the wrong number or show-up at the wrong location, do you? 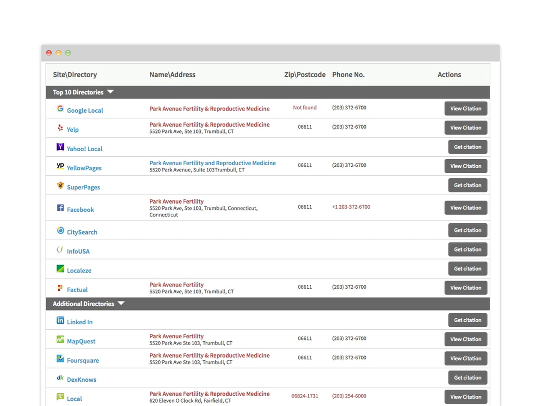 Two, search engines like Google and Bing have historically relied on directories like these to verify the address of a practice for their maps products. As a result, search engines have given a boost to practices that have clean Name, Address and Phone Number (NAP) information across all of their major directories profiles. That’s right, not only are links important for your rankings, but having accurate information across your online profiles helps your ranking too! Before we go further, let’s talk about these directory listings, or citations as we call them. A citation is any reference on the internet to your name, address, and phone number (NAP). Citations can be found complete or partial, with only one or two of the items listed. Some citations are unstructured, while other citations are structured as part of a webpage’s standard information. For instance, a local blogger could list the top five orthopedic surgeons in your city and include your name, address, and phone number–that’s a citation. Other times a newspaper or website will have a health provider directory, where you will have a profile that references your NAP – this is also a citation. While you can’t control that type of citation, numerous websites and internet directories allow you to claim your practice’s profile and keep this information up-to-date. It’s also worth noting that claiming a profile is usually free, but some will require payment in order to claim. In order to take advantage of your listings and citations, you should claim and optimize your citations so that each citation includes the same name, address and phone number information. If, for example, one citation lists your website as www.myorthopedicsurgeon.com and another lists it as www.theorthopedicsurgeon.com, you risk sending patients to wrong provider and are not maximizing the search rankings’ boost you could be having. INTERESTED IN IMPROVING YOUR LISTINGS? A full 90% of local search engine marketing experts say online citations are vital for your local search marketing success. Citations are one way search engines verify that your medical practice is legitimate. Anyone can create a website for just about anything these days, but if Google or Bing can’t find online citations to back up the website’s legitimacy, they factor that into search engine rankings. Additionally, these profiles increase your visibility online and push traffic to your website. For example, a potential patient may search for “shoulder surgeon” on Google. Because the search is so generic, your website may not appear at the top of search listings; however, online profiles on sites like Healthgrades, Yelp and Google My Business could show up. From there, potential patients can access your website. If your NAP information in citations isn’t accurate across the internet, search engines also take that into account for your search rankings. Eighty-six percent of marketing experts claim that quality citations are better than huge quantities of citations. If your phone number is listed as 555-555-5555 in one citation but as 555-555-5554 in another, Google tends to see that as untrustworthy. Inaccurate information doesn’t only cause problems for search engine rankings, however. It will also cause problems for your patients. If your phone number, address, or website is inaccurate, and they try to reach you and can’t, they’ll be frustrated and move on to another orthopedic surgeon. Another important factor in online citations is that many profile sites allow patients to add a public rating or review. Patient reviews relate first-hand the patient’s take on your expertise and skills to help other patients choose you for their medical provider. This makes it important that you not only claim, but monitor many of the profiles on the internet for your business. When a potential patient searches for a health related topic, search engines will run that query through their algorithm and populate the search with results that best match the search query. Today, for most health related searches, localized results are shown, which are influenced by citations. For instance, if a person searched for “orthopedic surgeon,” the first Google results are the top three local providers. That list of three providers is called a local 3-pack and is powered by Google My Business profiles. Your online citations heavily influence whether your practice shows up in the local 3 pack or not. Inaccurate or inconsistent citations makes it difficult for search engines to confidently place your practice on the map. It may also signal to them that your practice isn’t legitimate or that your information is old and likely to be inaccurate. Accuracy and consistency across all your listings verify that your business really exists and that you’re more likely to provide a quality experience to patrons (after all, if you spent the time to claim and update your citations, you’re probably doing well by patients). Once you claim citations across online profiles, you can update your NAP to ensure your citations are accurate and consistent – both for patients and search engines. The internet is full of sites where medical professionals can claim their profile and list relevant information (including their NAP!). Not all online directories and profile sites are created equal, however. Many of them are a complete waste of time. Others could actually hurt your search engine rankings instead of helping them as the directory is considered to be spammy by search engines. Given it could take you over 40 hours to claim all of the major directories listings for you and your practice, it’s best to start with the listings that will provide the most impact to your practice’s marketing efforts. These sites are dedicated specifically to the medical and healthcare professional. More often than not, these websites are designed to allow patients to find and evaluate providers. Patients can leave reviews to help other patients make decisions about their healthcare providers, and in many cases can book an appointment with the provider right on their profile page. For more indepth information about doctor review sites, check out our article about the 6 top doctor review websites. In addition to the healthcare and medical specific websites, there are many websites where “all” business can be found by those looking for a new vendor. Some of these websites are social media platforms (I.E. Facebook) where you can share articles or post updates; however, many social media platforms allow patients to leave reviews. Other websites are more like the yellow pages, a pure directory, and only list your NAP and other business-related information. What healthcare provider has time to be practicing great patient care and to keep up with online profiles? If you think it’s impossible, we think you’re right. You’re incredibly busy caring for your patients–which is just what you should be doing. Services like InboundMD exist so you can continue to provide high-level care while we manage your online presence. Our tool quickly finds your listings and citations, claims them, and keeps them updated. If your citations across the internet aren’t current, your patients and potential patients are going to have trouble finding your website. If you haven’t already done so, take a minute to check out your existing profile on some of the sites listed above. Is it accurate? If not, you’ve got work to do! Knowing what to post on your professional social media profile can be a little tricky, but that doesn't mean you should avoid these platforms! Here are 6 reasons why your healthcare practice should embrace social media.